Happy Labor Day weekend my ski bunnies! Are you ready to go skiing at the lodge? 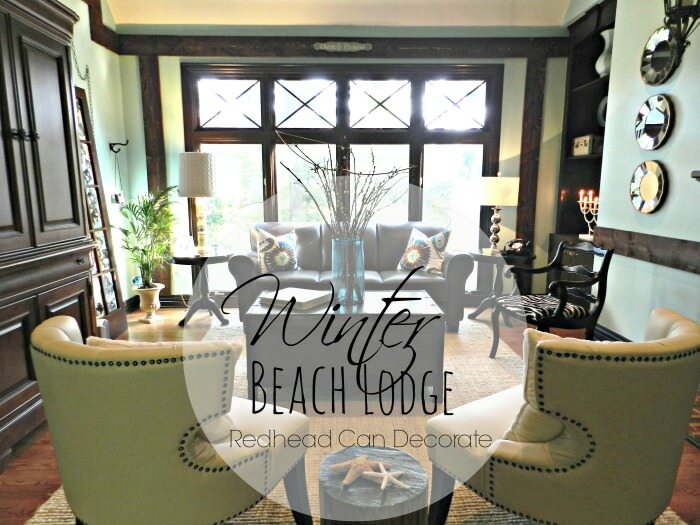 The “Winter Beach Lodge Living Room” is officially ready for you. How ironic that it just happens to be the “end” of Summer weekend. Sounds like perfect timing to me. I am so excited, and so relieved. Lets get this lodge party started. If you were really here with me right now, I would first ask you to close your eyes. and lead you to here. I would light you a fire. Then I would remind of you of what it use to look like. They were covering up our beautiful view, what was I thinking? The room felt warm, but too warm I think. More like a scorcher. We needed a fire hose in there. but we were ready for a change. Here’s a before / after . You can see how the room opened up. Remember the ski’s I had in the foyer? That’s where the “Winter Lodge” idea began. We had just gotten home from vacation on Lake Ontario. 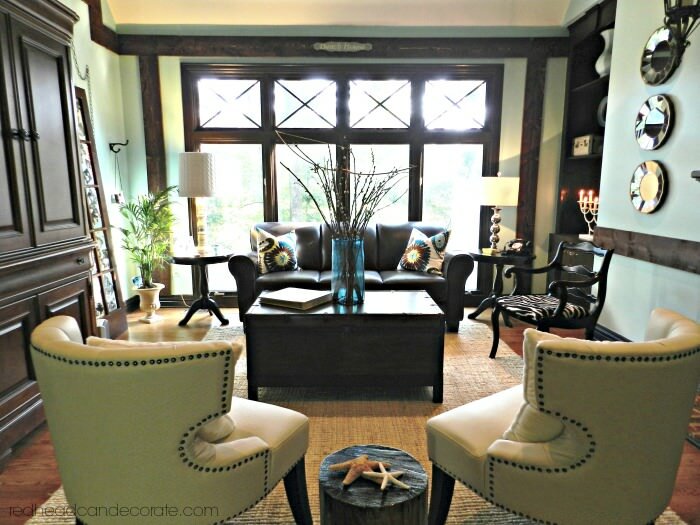 I was in a “beachy” way and wanted to transform our entire home into a beach cottage. HA! We live in Michigan, on a lake, but it’s more like a pond. Michigan is surrounded by the Great Lakes, and we have tons of lakes in this area. Still though, it gets very cold here in the Winter, and there is a lot of skiing. Then SWOOSH! The avalanche hit me. Why not mix the two? Lets go up stairs and I’ll give you the sky tour. Well look who’s waiting for us at the bottom of the stairs. Is she a cutie or what? Here’s the part where I tell you how we did it. Maybe you can use a couple of my ideas in your own space. First, we sold our sectional on Craig’s list. It sold so fast and we got a great deal. Then I searched for our new furniture. In the mean time, we painted. It was easier without furniture in the room. The color is quite bright, but I love it. Once we got that going, I realized the window moldings really needed to go dark. Painting those was quite a job, but if you really want something, you just do it. Then I took a break and began to look through Pottery Barn. Uh oh. 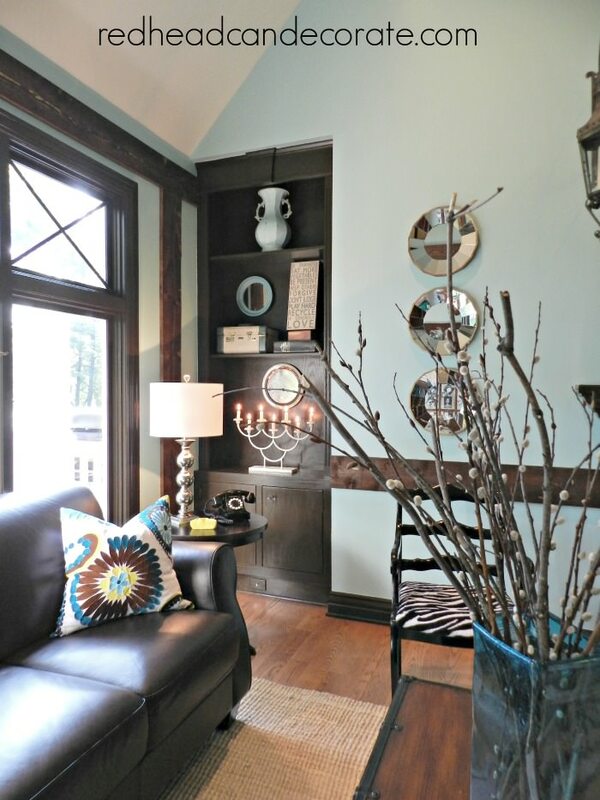 These rustic moldings would give the room such a cool “lodge” feel! I knew they would enhance our pretty windows as well. I showed Rick, and being the guy that he is, he said it could work. 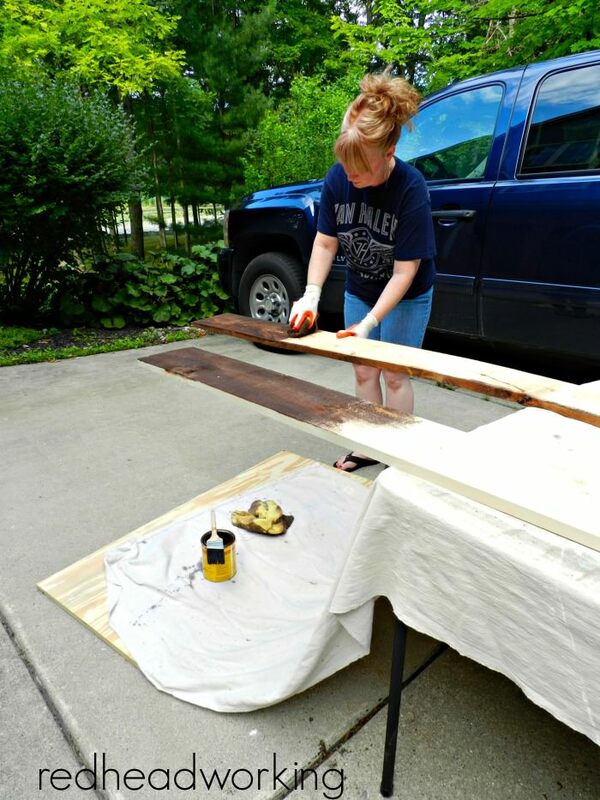 We headed to Home Depot the next day, and picked out the wood. 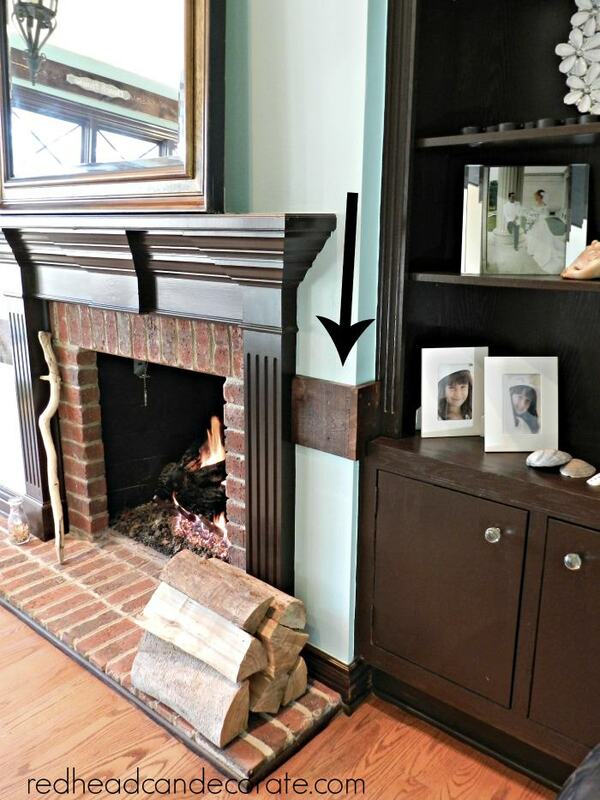 We used 1×8 rough sawn pine boards because they looked the most rustic. I got to work immediately and stained them with Minwax (English Chestnut) and then brushed on one coat of polyurethane. Rick measured and cut after I explained how I wanted them placed. 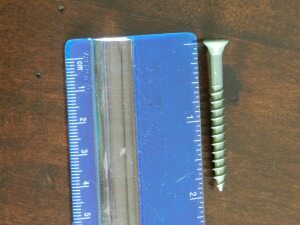 We used screws we had in our tool bench from some deck work. We located the studs, and screwed them into the wall. The only problem we came across was the return air vent. It was in our way on the left wall. We did a little “L” corner so we could get over that vent. I think it looks so unique. You may notice that we continued the moldings onto the other side of the room, but screwed them in as “chair moldings” instead. This way, we didn’t have to go under neath the big mirror. We were amazed at how much all of the moldings opened up the space. Did I mention they cost under $75 total? If I could, I would put these through out the entire house. You may have noticed the anchor on the wall. My hubby found her on line for $13. She is heavy, but adds some nautical flare. I added the chain and there she sits above our illuminated photo door. If you would like to know more about the door, I explain how I did it, “here“. You can also find this thrift store lamp I made over with my old sweater, “here“. We have a great view out this window, so binoculars fit right in. you would know that I found these babies at the thrift store too. Can you find them in the following picture? The chairs I found at Overstock.com, and the jute rug is from West Elm. Sofa is from Art Van furniture. Selling our sectional sofa really put us in a good spot to buy what we really wanted. That is a great first step if you are wanting to change a room. I revealed this stump last week. He really adds so much fun to the room. He’s part of the family now. I explain how we did it “here“. Early on I knew I wanted to change my Grandfather’s chairs again. I ended up using my Mom’s blanket to reupholster them. I think they add some “chic” to the room. Maybe even a little glam factor. You can learn more about that and the “new sew pillow” I made “here“. The “X” molding I stuck in the window were free. I had left over molding from another project. We measured corner to corner and cut them to fit tightly. Next, I painted them the dark brown I painted the window casings. Then we just stuck them in. No glue, no nails. Just edged in. The bow is an old bow we found in our old house basement rafters. My husband is a bow hunter, so this fits us and the “Winter Beach Lodge” theme. The pillows are from Macy’s and my Beach sign is from Hobby Lobby. The yellow ash tray I made in middle school. You’d like to spend the night in our “Winter Beach Lodge”? 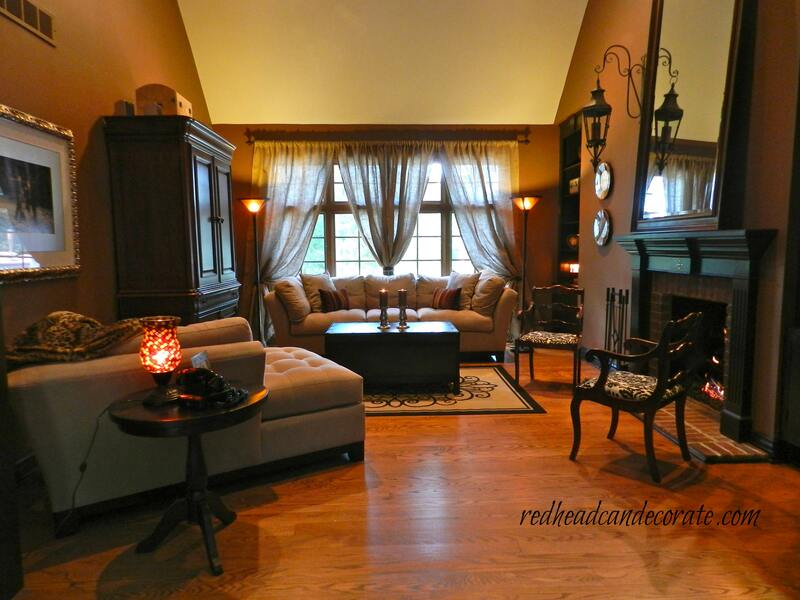 Living room w/ brown leather sectional & new lamp. Wow! Everything looks so terrific! 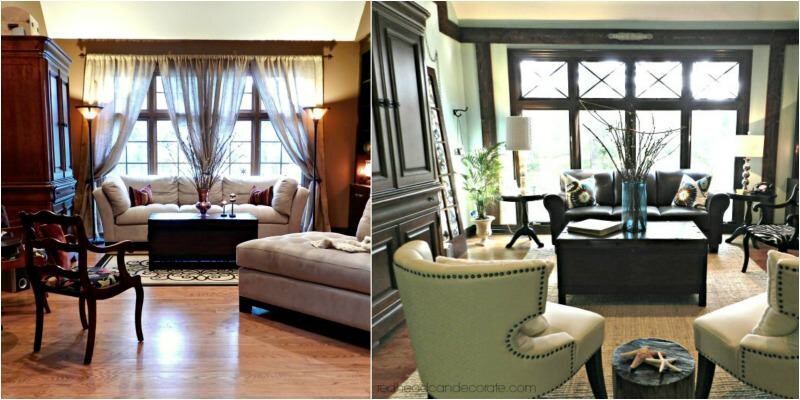 Beautiful job – love the rustic moldings – they give just the right touch. Have a fabulous weekend! Hugs! Wow!!! It looks amazing! You have a wonderful gift and vision too! 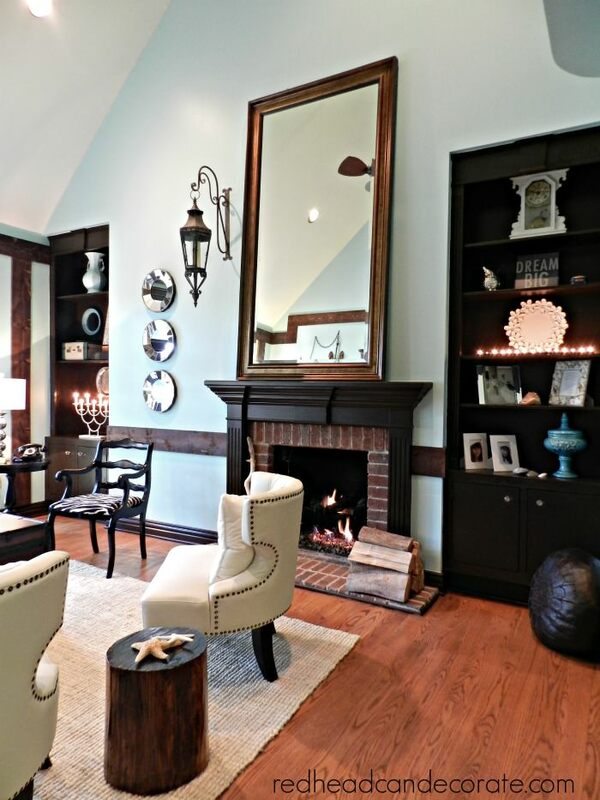 Where did that large mirror over the fireplace come from? 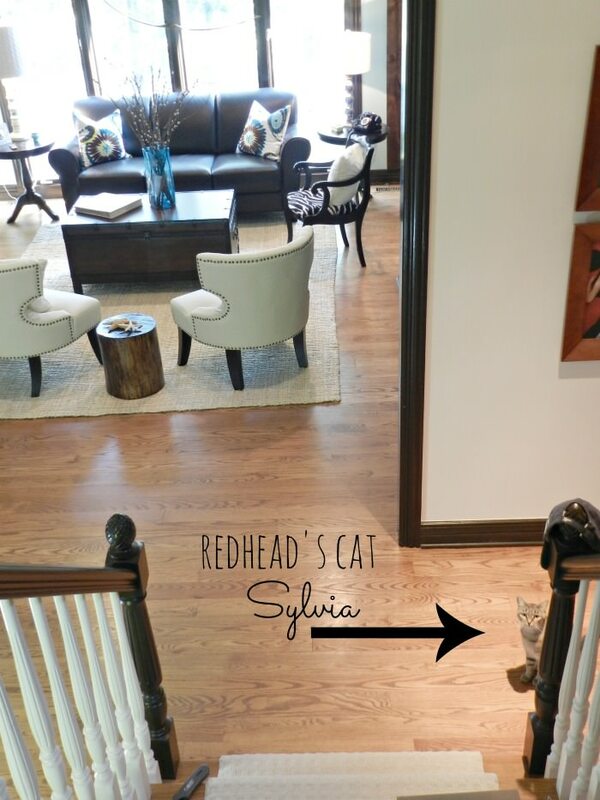 Sylvia is a cutie too! I like it. You and your DH did a great job. Julie this is gorgeous!! I love all of it! I am simply blown away over the transformation! I love it all. 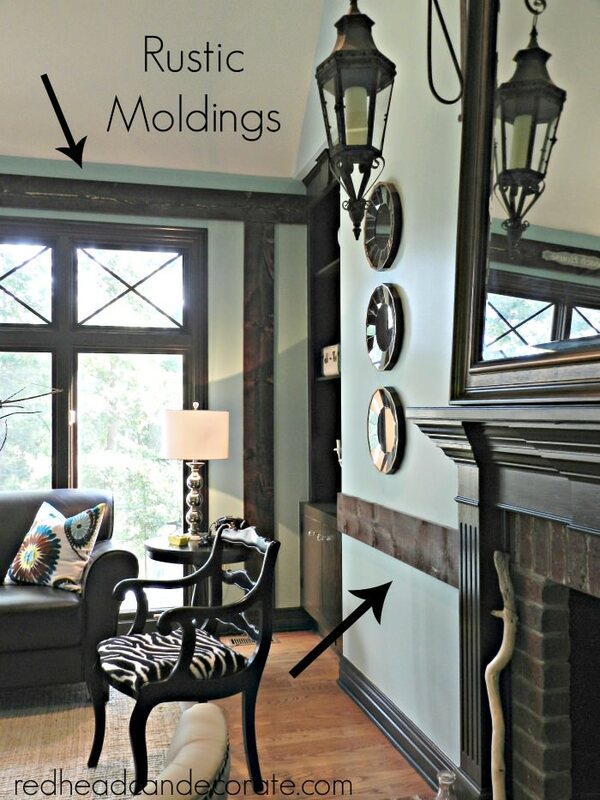 The molding is awesome. So is the cute little ashtray you made, how funny we made those back in the day LOL!~ LOve it Julie and Rick, nice team you make. Who would’ve thought of combining lodge and beach. Absolutely beautiful!! I love the color you painted, really opens up the room. Removing the curtains did too. The wood is just gorgeous! 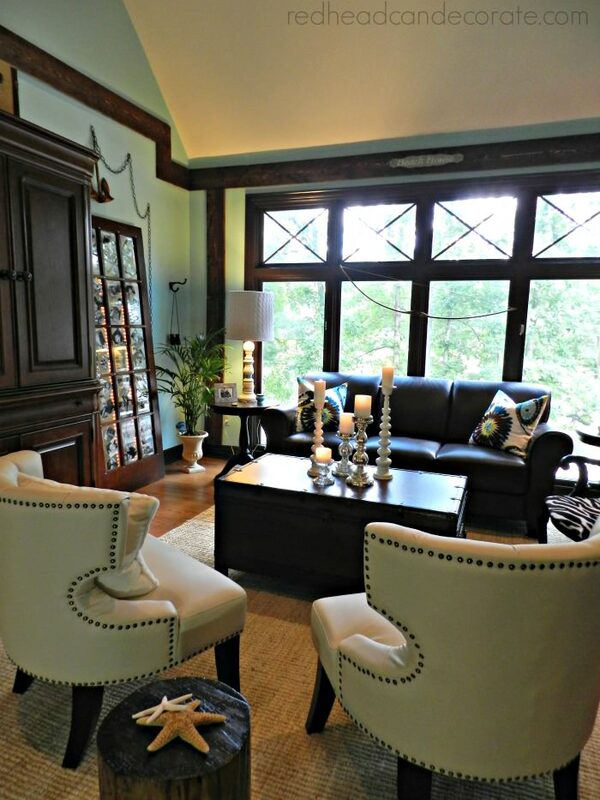 I think you two did a fabulous job with this room…. How do you get the pillows to stay on your leather sofa? Mine just slide right off, and it is very frustrating to always find them on the floor. The dogs love it, but I do not (dogs not allowed on leather sofa — the only furniture forbidden to them). Help? Fabulous job. 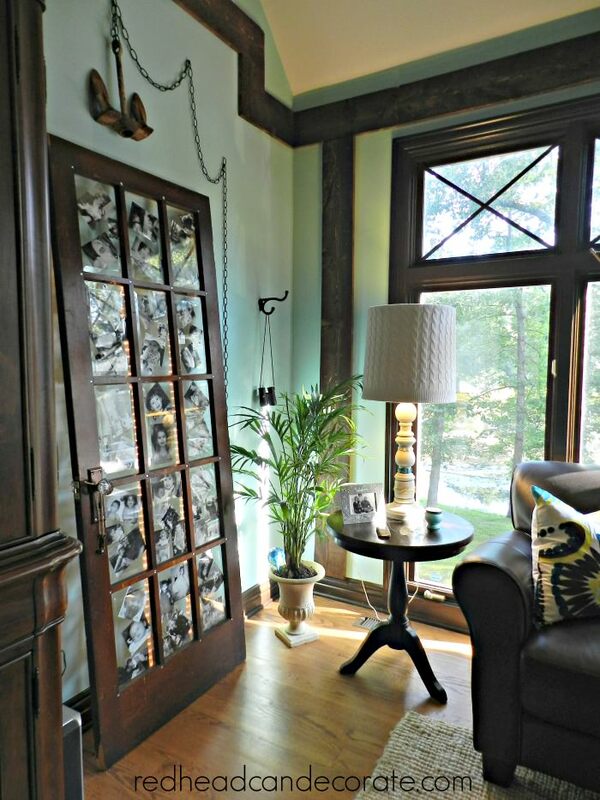 You thought of every little details and the added trim made the room. 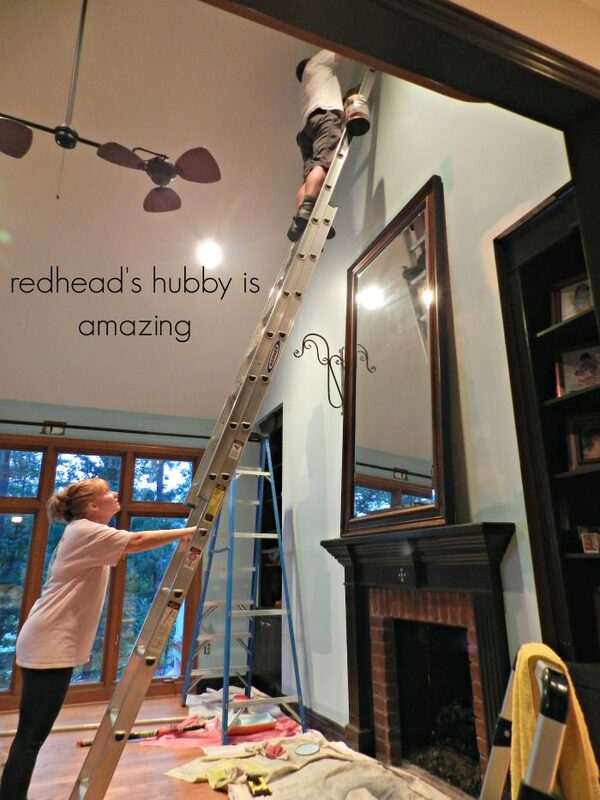 Wow, when you said Redhead Can Decorate, you weren’t just whistling Dixie. Ok, Fantastic job, the new rustic trim is fab the colour is fab the new rug… fab and the stump… yup, you guessed it… FAB!! 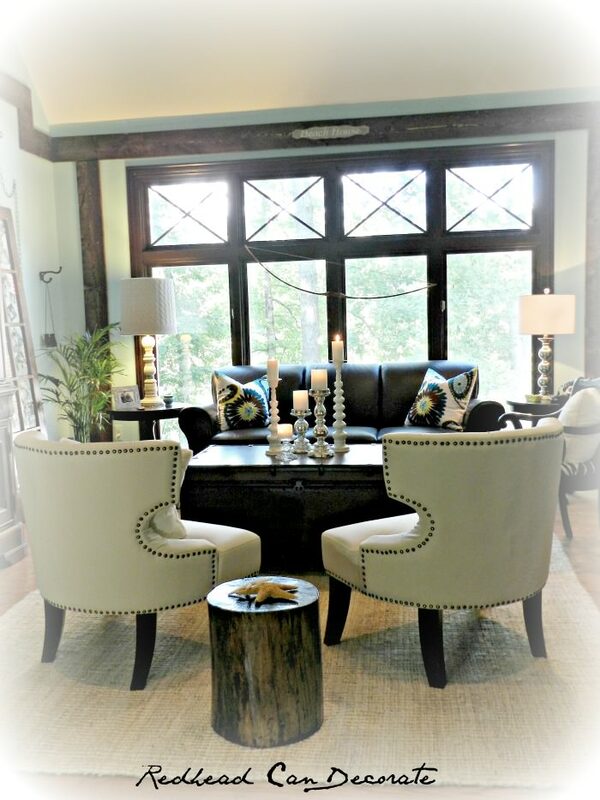 I love this room reveal!!! Wow great job. I have to tell you that when I saw your before picture I was all like “I can’t believe you covered up those windows with curtains. What where you thinking hiding those fabulous Xs” Then I read the part where you made them, and was like “OK they weren’t there before, and wow great job!” Love the window update, OK I love the whole living room. 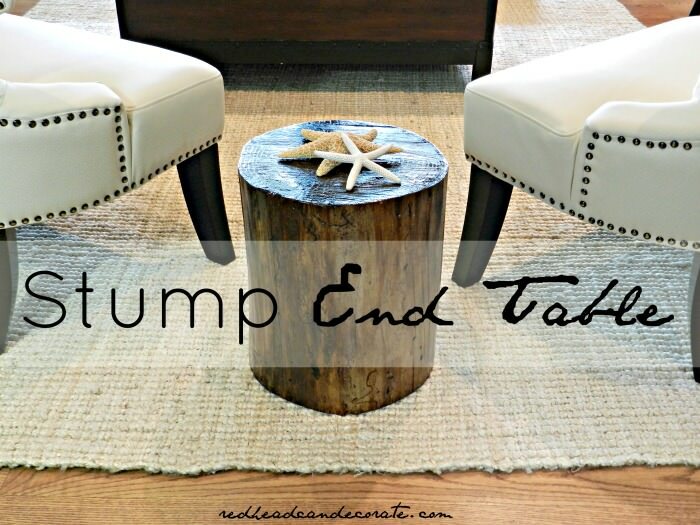 I also really love the stump end table. I think it fits in perfectly. 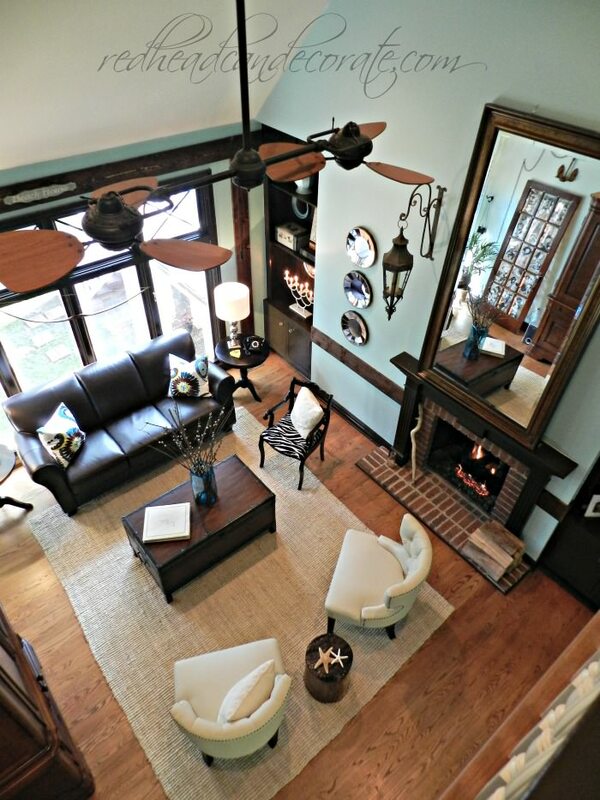 I love how all the elements pull together to make a stunning, but comfortable, living space. It is absolutely magazine worthy! Wow!! I love it! My favorite is the bow hanging in front of the windows. It looks like a totally different room. aaahhhh I wish I was in that room and I can curl up with a good book with fire crackling….Great job!! 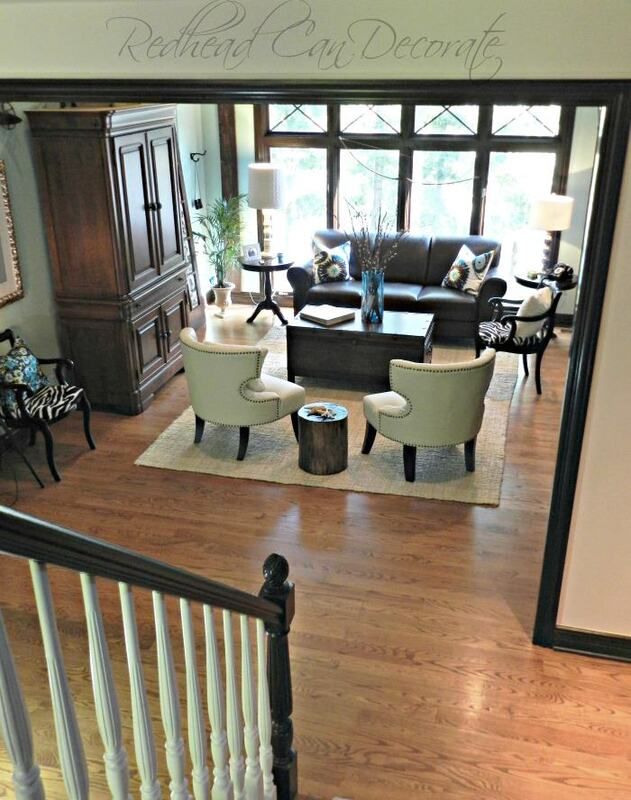 Julie, I enjoyed my visit and absolutely love what you have done to your living room. Your “beams” look amazing!! 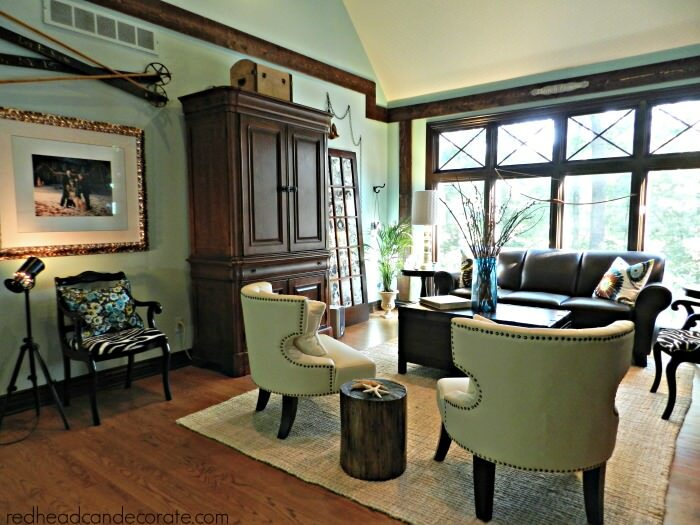 Wow, so many amazing and thoughtful details add up to one very beautiful room! I love the theme and you executed it perfectly! I could be so comfortable here! Wow, now that’s gorgeous! 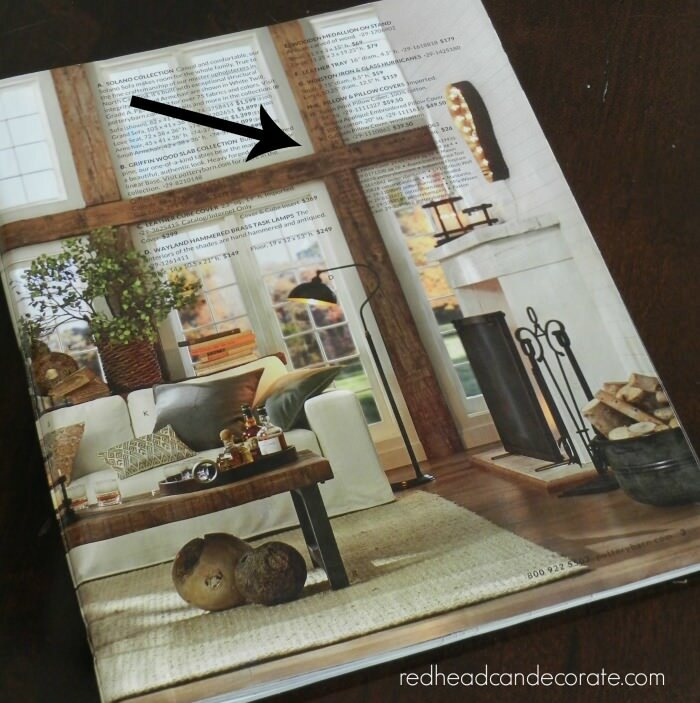 I love what you’ve done and the rusticy wood moulding looks perfect in there! Really and truly-Unbelieveable! It is so cozy and inviting! 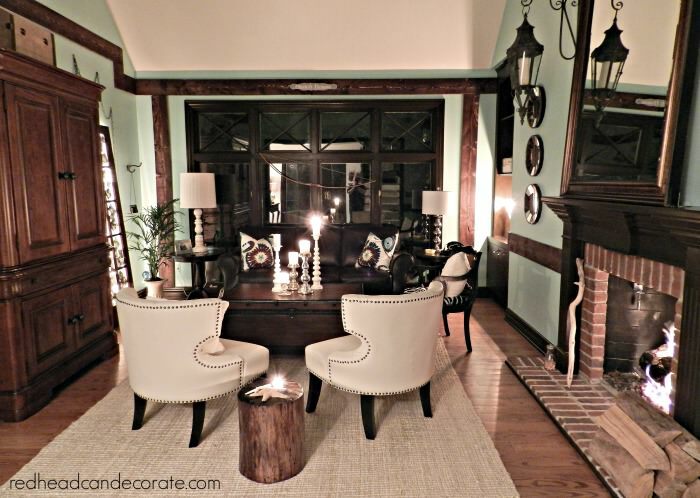 Love the molding, the chairs and well, everything. You are so inspiring Julie. Thanks for sharing. Pinning. Love this! Absolutely amazing. It is totally my aesthetic. I just pinned it. Great job, Red. 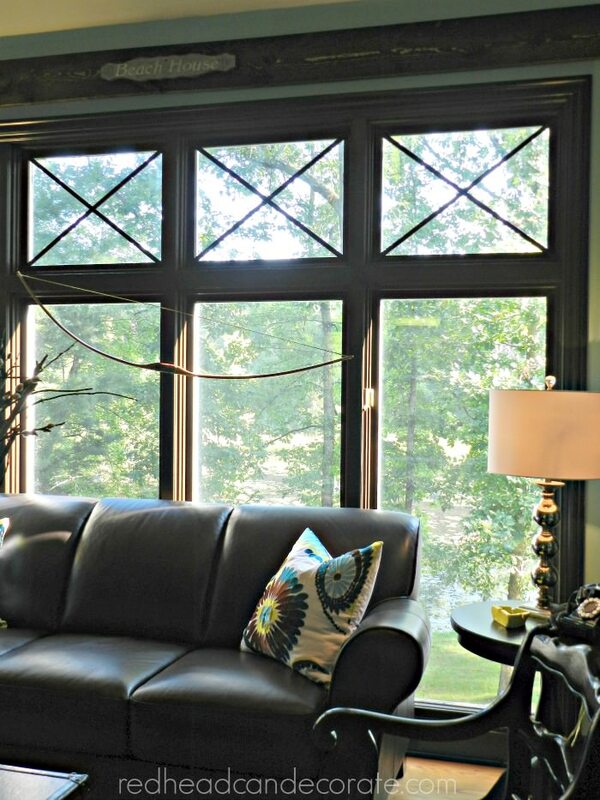 Your living room looks very inviting and beautiful !! Great job !!! This is beautiful. What color did you use on the walls? We used Balmy Seas by Behr Ultra from Home Depot. You may want to go lighter with Adriatic Mist though. I tried that first, and I wish I would have stuck with it. The pictures are deceiving. Balmy Seas is pretty, but very strong. Good luck! Oh, Julie!! It is just SO awesome. I mean, really. 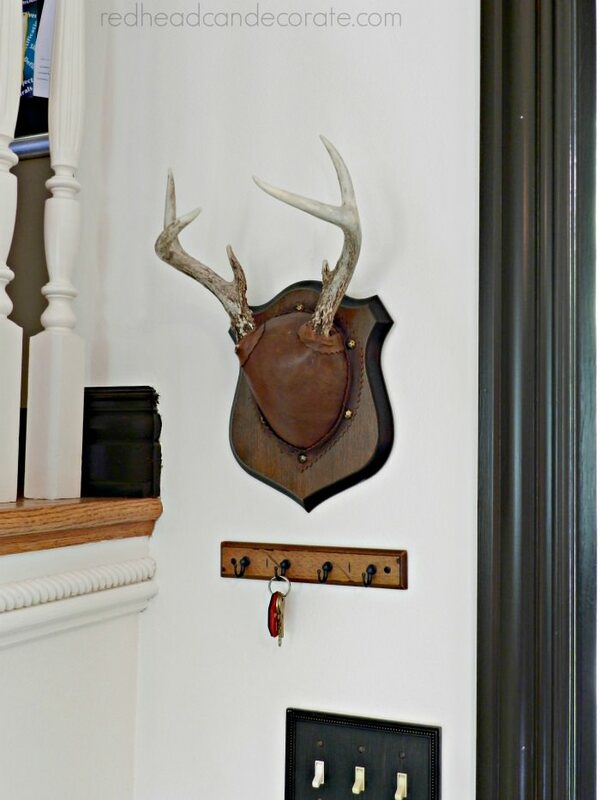 The rustic mouldings are just gorgeous…I can’t get enough of them. You’ve created such an amazing space. Way to go, friend!! ENJOY IT! So amazing! What a transformation. 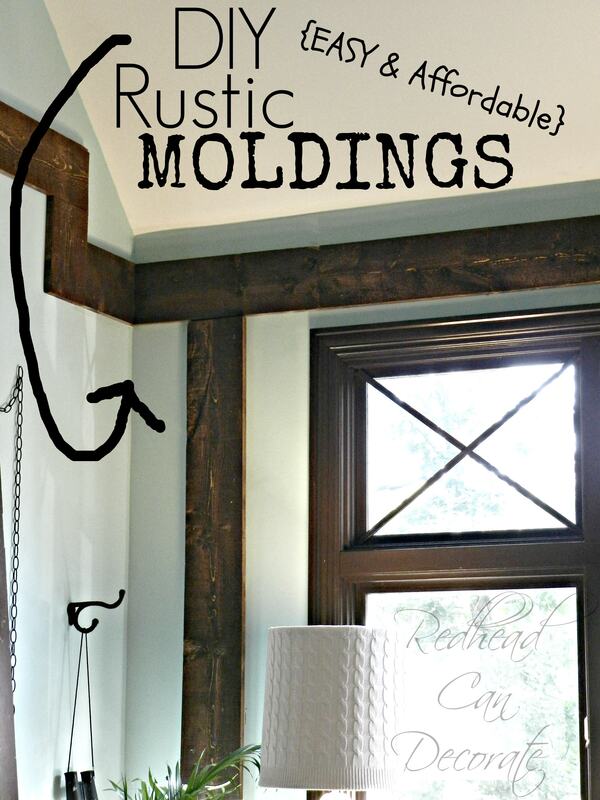 I can’t believe how wonderful the new rustic mouldings look in there. All of the details fit together so perfectly. I hope you are just loving your new space!!! So glad I found your blog. You have amazing ideas! Love everything. 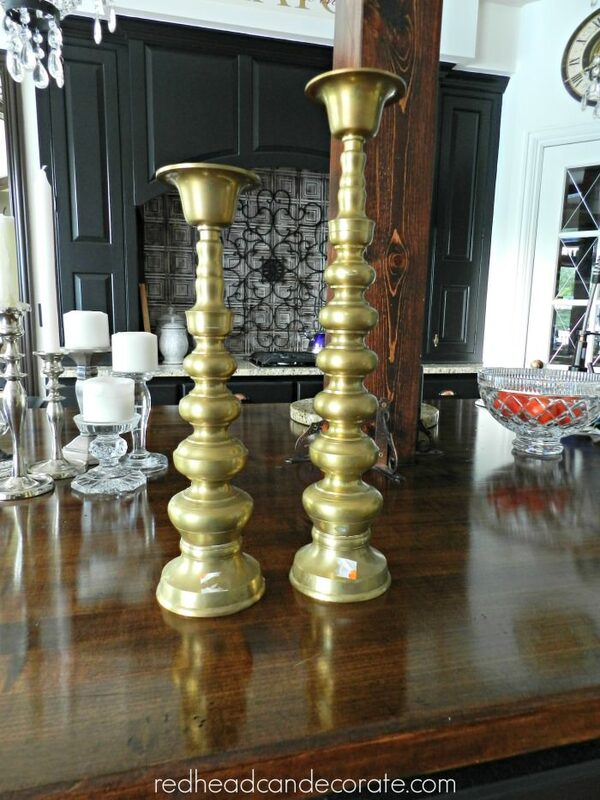 You’re Kitchen and Living Room is absolutely Gorgeous….I love your taste and “thrift store” find(s)…. I love your ideas, thanks for sharing. 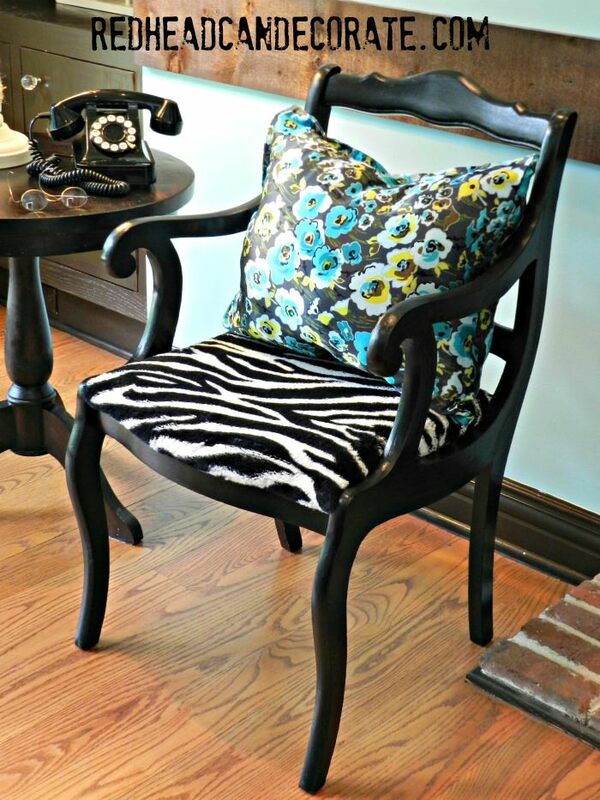 Found your blog via Thrifty Decor Chick. The windows look amazing with the curtains removed! I really like the x’s in the windows! Did you remove the inside trim on the lower windows (forget what they are called)? Hi Tammy, so happy you found me. Yes, I did remove the “muntin bars”. Ours are removable, but I know some are inside the window. Love, Love, Love! Just beautiful! 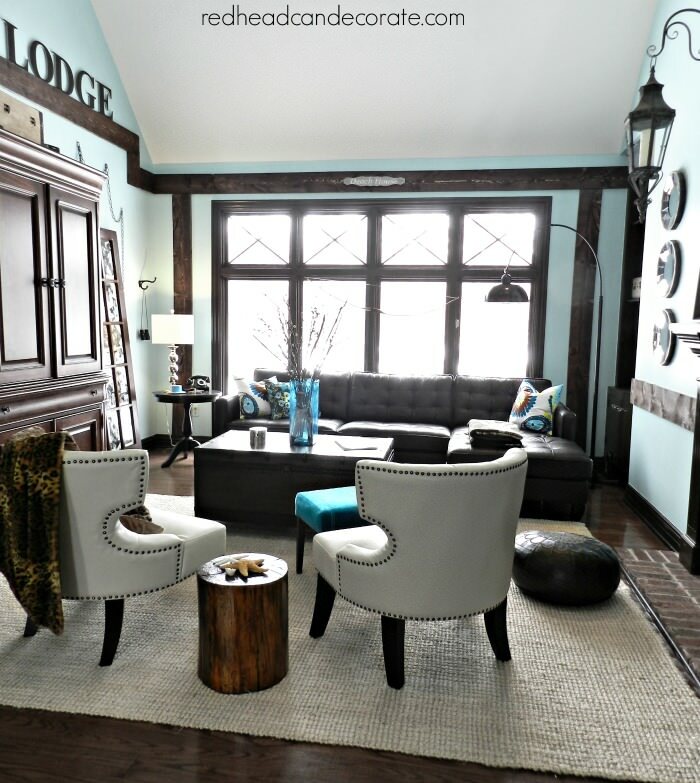 Would you mind sharing what color paint you used in your lodge/cottage living room? Thanks for sharing! did you change out the windows? the before shows windows with squares and the in the after they’re clear. No…just painted them and added the x moldings in the top window. Wow, this may be my favorite remodel of all blogs ever. Seriously. You have some very unique changes that are just gorgeous. Great job!!! I love your rug. I know it wasn’t part of the re-do since it was also in the before picture. Where did you find it?